Paul Brunton (1898-1981) is one of the 20th Century’s most well-known spiritual authors. His first ten books, based on his personal experience and research conducted on five continents, awakened millions to the reality and practices of a spiritual life and earned him a world-wide following. In the 1950’s he abandoned his travels and worked in solitude, compiling extensive “notebooks” on subjects relating to the spiritual life. His life was filled by surrender and dedication, patience and practices, studies, travel and research. Much of the time he pursued a totally solitary path. Throughout the world the silence of his heart was listening on behalf of those who sought the deeper meaning of life and who were without the personal guidance that he himself was privileged to receive. Only a few of his readers had the blessing to meet him in person. Yet all who were open had the opportunity to know him deeply through the communication of the heart, and telepathically through the communication of the mind. 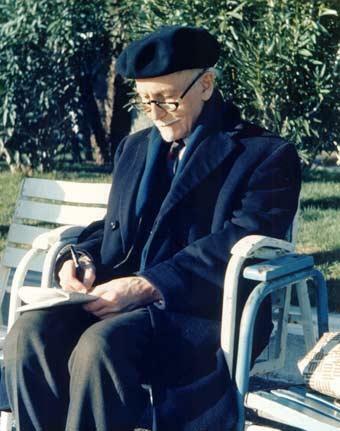 Reading his books one can perceive his silent presence and the power of the ideas for which he was a channel. Healing was a topic of great interest to Brunton. Always curious about alternative approaches to health and in the spiritual basis of healing, he approached this issue with a critical mind and with the ability to separate truth from illusion and false hope. The selections in this book demonstrate the value of a thoughtful, spiritually-informed analysis of the topic of health, healing and healers. Most of the material in this book is taken from the volumes on “Healing of the Self” and “The Body” in The Notebooks of Paul Brunton (Volume’s 7 and 4i, respectively), which are published in the original English by Larson Publications for the Paul Brunton Philosophic Foundation. The reader is encouraged to contact these websites for additional information about Paul Brunton, his life, and his writings, including the posthumously published sixteen volumes of The Notebooks of Paul Brunton. In the name of Paul Brunton’s immense love for humanity, and in the name our eternal love for truth, we dedicate this selection of living, inspired thoughts to you, that it may help you find a bridge between your heart, mind and Overself, and that in reading these selections you may find a pathway to greater health and well-being of body, mind and heart. Dismayed by the failure of my physicians' last resort, I was sitting up in bed reading a passage from an old journal of John Wesley about spiritual healing. It quoted a friend as saying: "I could not move from place to place, but on crutches. In this state I continued about six years. At Bath I sent for a physician but before he came, as I sat reading the Bible, I thought, 'Asa sought to the physicians, and not to God; but God can do more for me than any physician'; soon after rising up, I found I could stand. From that time I have been perfectly well." Sit upright on a chair of comfortable height, with the knees and legs together, if comfortable, or slightly apart if not. Lean slightly forward, keeping the spine straight, and allow both the arms to hang down full length and lifeless, like heavy weights, from the shoulders completely relaxed. Both hands are then lifted very slowly at the elbows, almost to shoulder height, then abruptly dropped, palms upright, on the upper thighs. Keep the feeling of limpness and heaviness in the arms, with the lower part of the body utterly relaxed. Picture an ethereal aura of pure, white, electrifying Light all around you. Then, imagine this magnificent Light is actually pulling you upright by the top of your head. Its compelling force should, as a result, automatically straighten the spine, and the back of your trunk, neck, and head form a perfectly erect line. Finally, imagine the Light is pervading inside the whole of your body. This exercise should give a feeling of physical refreshment and complete physical relaxation. It is also useful when having to listen to lengthy talks, lectures, and so on, or when reluctantly trying to practise meditation after a fatiguing day. Try to see and feel that the aura of Light has an actual substance and that It is becoming part of you, that you are melting into It, becoming one with It. Next, think of it as being the pure essence of Love, especially in the region of the heart. When this Love has been experienced as a sensation of heart-melting happiness, let it then extend outwards to embrace all the world. This exercise should give a feeling of being in harmony with Nature, the universe, with all living beings, and with humanity as a part of Nature. Think of the white Light as being Nature's intelligent and recuperative Life-Force. Let it pour in, through the top of your head, passing directly to the solar plexus centre, which is the region which must first be worked on and affected if the healing force is to become efficacious. Thence send it to any afflicted area, remaining there. Feel Its benevolent, restorative, and healing presence working upon it. In order to be fully effective this exercise must be accompanied by intense faith in the recuperative powers of this Light. Astonishing proof of its effectiveness in relieving a troubled organ or curing a diseased part of the body, when persevered in for a sufficient period of weeks or months, has been clearly shown by results. In some cases, paralytics have regained full use of their disabled limbs by following the outline given here. Let the White Light enter the region of the heart, remaining there. Form a mental image of the face of the individual you wish to contact, and reduce it in size until it is small enough to fit into the palm of your hand. Place this tiny image in the centre of the white Light permeating your heart. Endeavour actually to see the individual there in your heart. This exercise should be used to promote physical or mental help to a distant friend, to bring about goodwill from one who has expressed enmity, or to establish a deeper spiritual relationship. It is also useful in the student-teacher relationship, because it promotes better sympathy and affinity, as well as strengthening the telepathic link. Note : Where imagination is well developed the attempt to visualize light may be used, but where either the intellectual or the instinctive preponderates over it, the attempt need not be made--only the unseen power invoked and directed. Lie flat on back on flat surface (for example, rug on floor). Let body go completely limp. Let go all personal problems. Reflect on the existence of the soul which is you, and on the infinite life-power surrounding you and in which you dwell and live. Lie with arms outstretched and palms open, so as to draw in life-force either through palms or through head. (This makes contact with higher power through silent meditation, and it draws on the reconstructive and healing life-force attribute of this power.) Draw it into yourself. Let it distribute itself over the entire body. Let its omni-intelligence direct it to where it is most needed, whether that be the affected part or some other part that is the first cause of the sickness. Place hands on affected part of body and deliberately direct force through hands to body. A feeling of warmth should be noticeable in palms of hands. Recollect through imagination the all-pervading sense of God and its infinite goodness. Allow at least about twenty minutes to a half hour for this practice each day, but you should continue for a much longer period if the desire or capacity for it arises. Select a time of day when you can be alone, free from disturbances, and when you are free from emotional reactions to any personal matters other than this need of being cured. It would be useless to treat these instructions in a merely superficial and external way, for then they could be followed and finished in about sixty seconds. There are two prerequisites that must be satisfied for these instructions to be effective. First, the whole of one's mind and feeling should be concentrated on each of their separate parts as unfolded in each sentence. Second, it is essential that you should not leave any part and pass on to the next one before you have fully soaked yourself in and surrendered yourself to it. There must be no haste. Posture : Assume supine posture, lie flat on your back on a couch, completely limp, no tenseness in the body, entirely comfortable, quiet, and relax all muscles from head to foot. Merely lying down is not enough; loosen also the muscles in your lips, eyes, and hands. Close the eyes. Breathing : Concentrate on the rhythm of breathing for a couple of minutes. Give it all your attention for this period until you are so immersed as to become unified with it. While concentrating, make the inhalation and exhalation breaths of equal duration. They should be long deep slow and even, not jerky and not strained. This slowing down of respiration should result in a lessening of tension. Making contact on the physical level : Begin to think of and dwell upon the One Infinite Life-Power, filling all space and pervading the entire universe, existing everywhere, containing and permeating all creatures, all humanity, including one's self. Accept and stress its existence. Next call on its help, then concentrate on the idea of its recuperative power, which develops and sustains every cell of the body from birth, heals its wounds and knits its broken bones, for your own case. Treating the body : Imagine this Power to be flowing into you as a White Light. Mentally draw the current into the body, through the forehead, the palms, and the solar plexus. Lastly, bring it to the diseased part of the body needing healing and concentrate it there. Place a hand lightly over this part and bathe both hands and affected part with the White Light, trying to feel this intensely, for about two minutes. Forget the rest of the body, and hold full intense attention here. Then with the mind's eye, forget the sick part. Become relaxed again, letting the Light immerse in and distribute itself throughout the entire body. Reaching to the soul : Think of the whole body as being a manifestation of Creative Intelligence and as a projection of the higher self. Next regard it as a perfect thought in the World-Mind. Finally forget it entirely. Lift consciousness above the plane of the physical world. Immerse thought in the concept of the higher self alone, forgetting its projected personal self. Next, empty the mind as far as possible of all thoughts and seek inward sacred stillness. At fixed or odd times during the day he stops the pressure of life and people on himself and learns by repeated recollection to remain consciously relaxed throughout the day, even if it be only for a minute or two. Whenever possible, take off five minutes every hour for relaxation practice at fixed times.